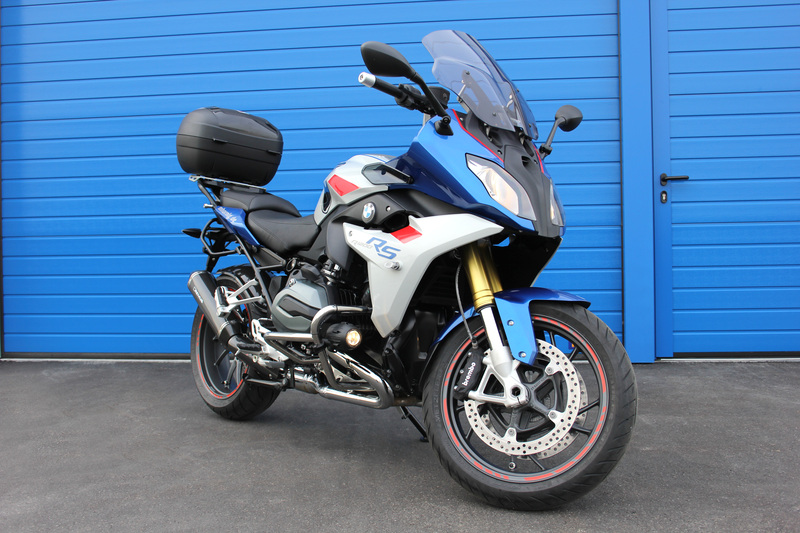 In order to improve the driving comfort on our R1200RS, we installed a smoke grey touring screen and changed the padding of the front and rear seat so that an enjoyable driving will be possible even on longer trips. Our handlebar risers also contribute to the fact that the driver is able to enjoy a relaxed driving experience by adopting a more upright sitting position. On longer tours it is, with regard to comfort, also important that all luggages can be stored properly. 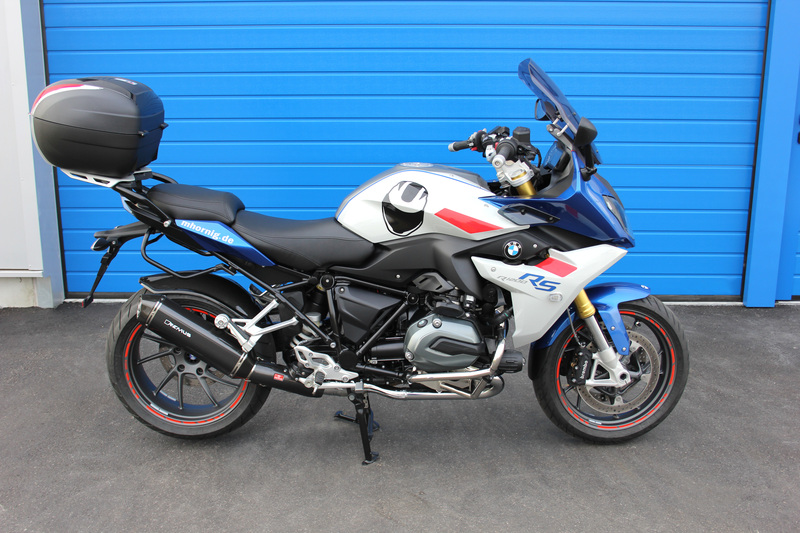 In order to ensure this, we have mounted a GIVI top case with 33 litres of capacity and the corresponding top case mounting onto our R1200RS. 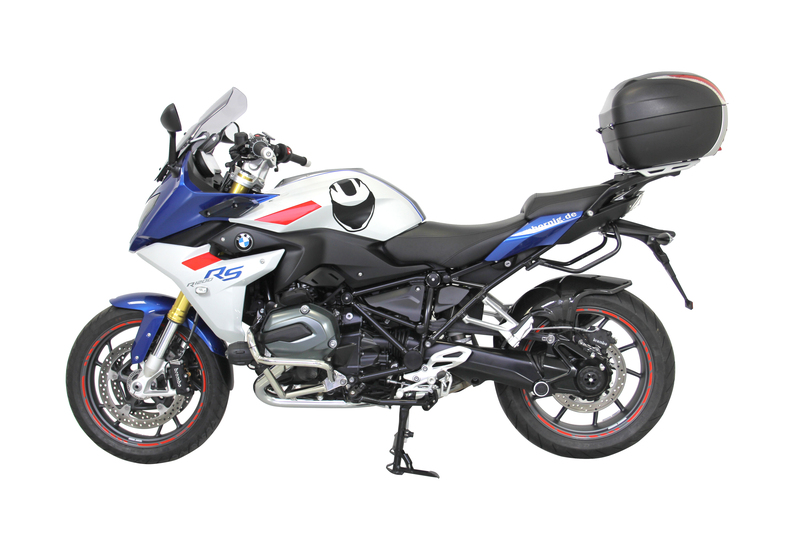 Besides the improved comfort we also attach high importance to an increase in security for the rider as well as for the motorcycle itself when we build our motorcycle conversions. In order to prevent the removal of the oil filler plug by other people and a resulting potential contamination of the engine oil, we installed our oil filler plug with emblem in black. This oil filler plug can only be removed by means of a size 3 Allen key or a Torx key T10. In the case of a spill or a tilting over of the motorcycle, our crashbars avoid damages of the engine. Our side stand foot enlargement guarantees a secure stand of the bike on any terrain by increasing the contact area by more than 100%. For many motorcyclists the original shift lever and brake pedal are too thin and do not provide proper support when shifting or braking. Therefore we also took measures here and installed our shift lever and brake pedal extensions whereby the risk to slip off when shifting or braking is reduced considerably. 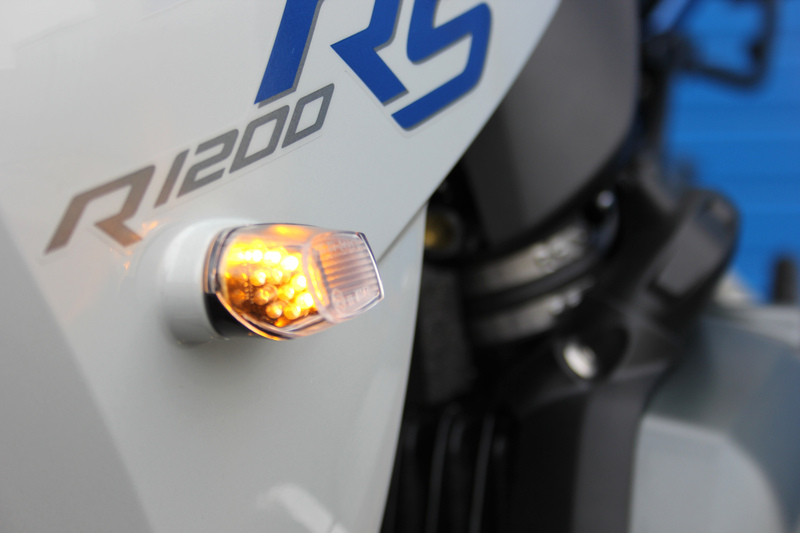 So that our R1200RS is more visible in traffic and is not accidentally overlooked, we installed additional halogen lights on the crashbars and equipped the bike with our Magnum horn Wolo. This horn reaches up to 139 db and thus reduces the risk of not being noticed by other road users. 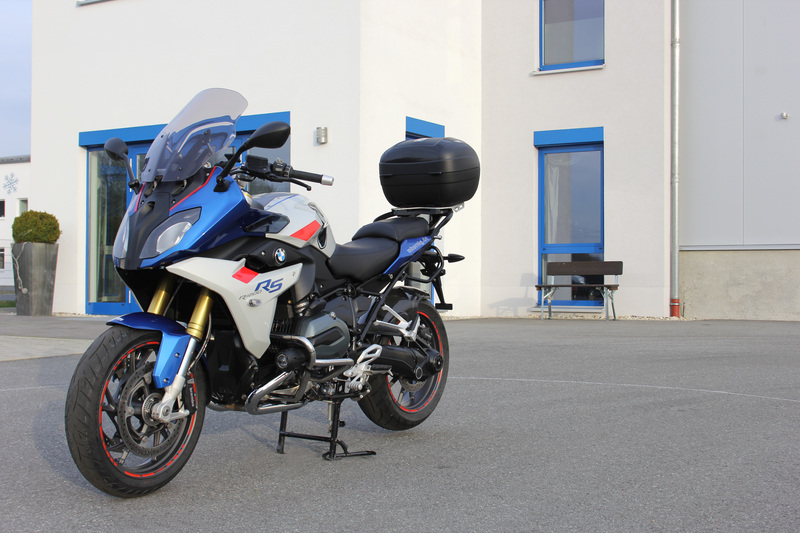 The rear mudguard which is made of carbon fibre protects the spring strut, the exhaust system and the legs of the rider and the passenger against splashing water, dirt and stone chipping. Our cooler protection on the one hand serves for the protection of the cooler against flying stones and contamination and on the other hand enhances the overall appearance of the motorcycle by creating a new eye-catcher. 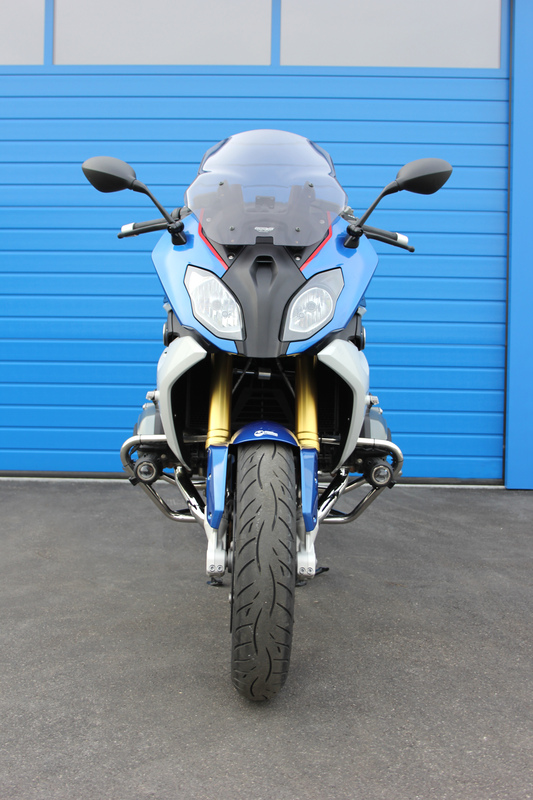 Other interesting details that substantially improve the look of our R1200RS are our covers for the suspension mounting, our frame covers for the engine mounting as well as our rear frame covers for the open holes beyond the seat. 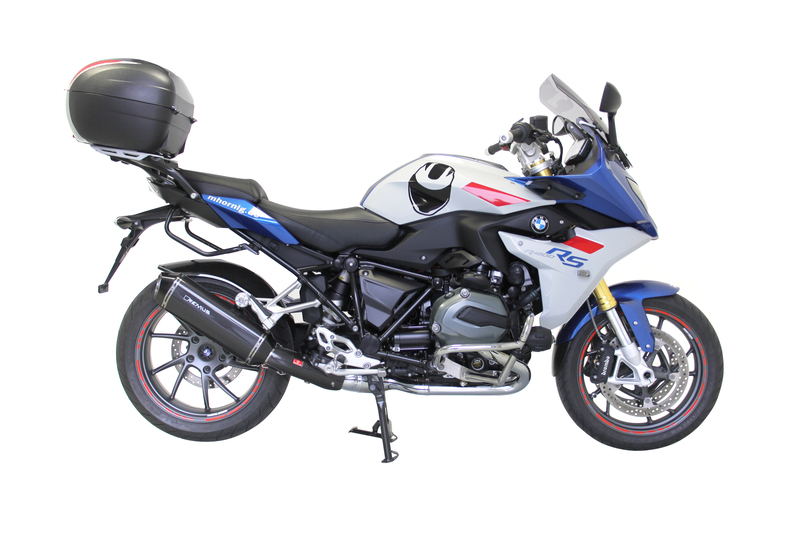 Furthermore, our frame cover for the left side of the R1200RS, our swing arm pivot covers and our frame covers for the engine mounting in the rear contribute to the visual redesign of our RS. Our rear wheel centre cover creates another highlight on our motorcycle. All of the above mentioned covers were installed in the colour black. In order to embellish the foot brake fluid reservoir we also developed a proper cover and attached it to our R1200RS conversion. Moreover, we equipped the handlebar with end weights which are made of aluminium that is anodized in silver. So that a navigation system can easily be fixed on our R1200RS we installed our GPS mounting with RAM-ball in combination with a clamp (60mm) and a RAM-ball plate. By means of these products the navigation system can be positioned wherever one wants because the clamp can be rotated flexibly. The original front turning signals in the fairing were removed and replaced by LED fairing turning signals. For the purpose of the redesign of the motorcycle in terms of colour we varnished it in the motor sport colours blue, red and white and affixed red rim stripes as another highlight. 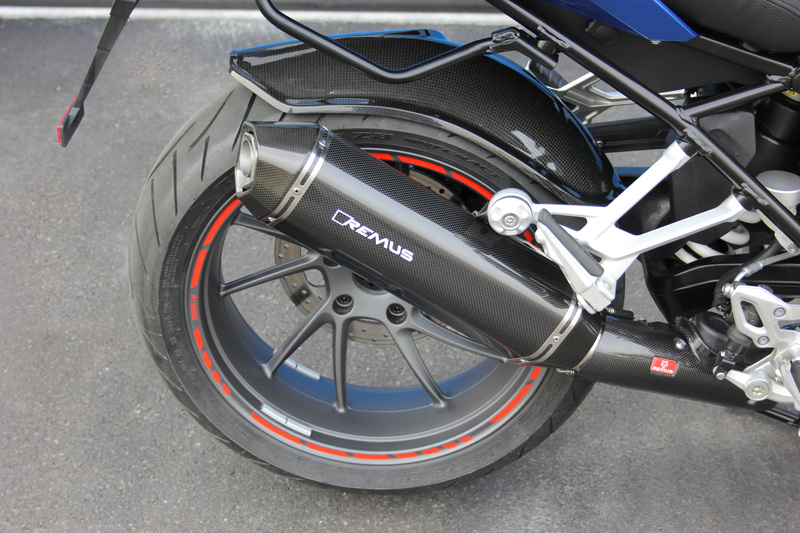 Finally we replaced the original exhaust of the R1200RS by the Remus HexaCone made of carbon fibre.